Online Poker vs. Live Poker – Which Is Best? Comparing online poker to live poker is almost like saying that they&apos;re two sides of the same coin, but only if you glue a Euro coin and a Drachma coin back to back. It&apos;s still currency and the same rules apply, but the two couldn&apos;t be more different, owing to a number of small but crucial differences. For most budding poker players who start their careers online, this realization will hit them in the face like a sock full of coins as soon as they sit down at their first professional poker table. Quick Jump - World of Online Poker | Brick & Mortar Casinos | Tactics | Stay Informed | Which One is Better? 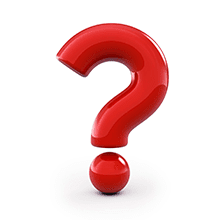 | How Different are Tournaments? | Which is Best? 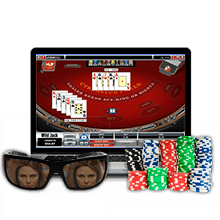 Online poker rooms are in constant bloom as more and more players are enticed by the world of poker, and it is the most convenient form of poker for newbies to take their first leap into. After all, nothing beats sitting on your favorite couch with a laptop, cracking a beer open and playing your favorite tunes in the background while spending an evening collecting chips. And, you can do this in your pajamas, or your underwear if so you prefer. Poker sites have caught on to this and offer players casual play with fake money to further entice people. You have nothing to lose right? Tables of any size and of any style you desire can be found with the click of a button, from Omaha to Stud or anything else. Players are also ranked from their victories and defeats, allowing you to choose a table where all the players are of approximately the same skill level. This contrasts with a casino&apos;s own unique atmosphere, with cocktail waitresses buzzing around your table refilling drinks, friendly dealers and also that enticing possibility that tonight you might take down the resident card shark. This outlines an obvious but very important detail; you are playing against actual people. Poker has always had a psychological element to it. Expert players will attest to this with their ability of reading their opponents through body language and ‘poker tells&apos;. Trembling hands, sudden eye movement, heavy breathing; these are all tells that will give away your hand. Top players such as Dave Negreanu and Phil Ivey often can tell you exactly what hole cards you have almost as soon as you look at them, simply by reading your expression. If you have ever wondered why most players play with sunglasses in dimly lit poker rooms, it&apos;s not because everyone&apos;s spontaneously contracted pink eye. It&apos;s because the eyes often betray your thoughts. This is one of the advantages to a new poker player who is still learning the ins and outs of poker when playing online, as physical tells are not present there. Established players also make use of aggressive tactics like constant eye contact to unnerve their opponents or use fake tells to bait other players into a trap. The only tells you can get in online play is the betting pattern and speed of your opponents. This skill translates very well to real play as well, where you can make judgement calls based on the way other players bet and how much they bet. A raise on the blinds, a bet on the flop and a check on the turn and river cards might indicate that the player missed their flush or straight draw, but is still holding a solid pocket pair. Or a check on the blinds then continues aggressive calls followed by an all-in might indicate that the player is bluffing a monster hand. You will soon get a feel of the overall blueprint of betting patterns and then learn to modify it according to your opponent. The level of anonymity in online game produces obvious results. It is very hard to be intimidated if you don&apos;t know, or can&apos;t even see your opponents. This also creates the opportunity to make friends via the accompanying chat rooms if so desired. This is no way exclusive to online play, but you tend to be more comfortable engaging in an online forum. 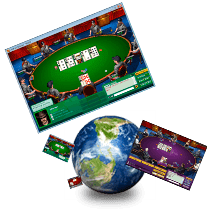 Online play also offers the chance to play multiple tables at once. 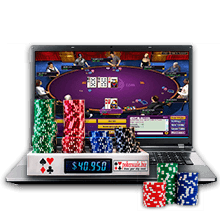 Experienced online poker players will soon find themselves bored if focusing on just one table even though they are very fast paced games compared to live play. Pretty soon they will play 2 to 4 tables at the same time. Keeping focus on multiple opponents and flops will help you learn to multitask. This will help you greatly when joining a live table, since there is no one to help keep count of all those numbers and everything has to keep going inside your head. Another important difference from the digital world to the real world is in fact the digital aspect of online play. While playing in any online poker room you are presented with a lot of different information such as your chip count and opponents&apos; chip counts on the fly. There can also be various statistics displayed about your opponents such as rating, number of times each has folded, number of times they stole the pot, etc. All this readily available data makes a gigantic difference when it comes to calculating odds and helps in your decisions when the dreaded All In is announced. In poker offline, you have to keep these numbers going in your head to a certain degree if you are to maintain this edge in the game. Even in the best live poker rooms I have seen countless players who overestimate their opponent&apos;s stack or misjudge the amount of chips in the pot. In a casino you will often hear players asking the dealer how many chips are present. This will turn into a lengthy game, which is not possible in online play, as rounds are rigidly timed. This again lends its own edge to the game, as some players will use these tactics to frustrate others into making careless moves. This is one major disadvantage when you migrate from live play; online players rarely get a chance to develop their patience, especially since many players often play four tables at a time. Which is Better - Poker Online or Poker Offline? Two clicks of a mouse and you're ready to play. You'll never be waiting for a table to open up. Test your strategies at no risk. Get bonus cash just for playing. You don't get the table banter. it can be hard to step away from the game. Everything from free meals to free rooms. Enjoy the glitz and the glamor of a real casino. It is nice to be served. Table limits can be high. The minimum bet might be above your limit. The noise in a casino can put you off your game. You've got to get dressed up. No playing in your pajamas. There are also certain advantages to online play when it comes to tournament play. Online you can practically enroll in any tournament you desire, if you can fork out the entry fee of course. Sizes, no-limit, entry fee, high stakes, these are all choices at your disposal. Local tournaments by your favorite casino will always be available to you, but they are nowhere near as often and accessible as when playing online. Also the fact that you are in your comfort zone instead of a foreign environment will greatly help boost your confidence. Plus you can play without pants if that is your fancy. 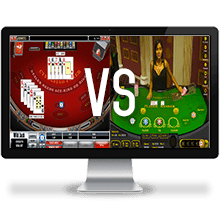 So Which is Best, Poker Online or Poker Offline? After reading this you might get the feeling that live play is basically no man&apos;s land, especially if you are a beginner. But there really is no need to be discouraged. Although it is a different animal, live poker is nothing to shy away from, as the greatest excitement can come from this style. The adrenaline rush when you pick up that pocket aces and then trying really, really hard to not blow your cover by soiling your pants; that&apos;s one of the main reason why we love poker. As noted earlier, expert players can read average players&apos; cards from their tells – both online and offline. This becomes a lot harder when you put a group of professionals together at the same table. Very quickly and very often you will get a heads up battle between two players, even as there are still eight players left on the table. The tension immediately becomes plaster thick as the players try to out read each other. If at this moment you are visualizing two people frowning at a chessboard, you are not that far off the mark. In fact, that&apos;s not a bad way to think about it; poker, it&apos;s chess, but with cards.